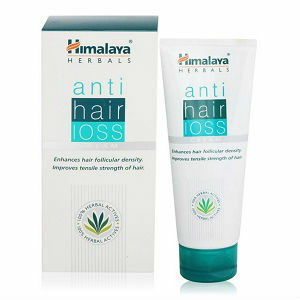 This is a review of the product Anti Hair Loss Cream manufactured by Himalaya. The manufacturer of this product claims that it can stimulate the active phase of your hair growth cycle and as a result, control your hair fall and promote growth of your hair. Read on to learn more about its ingredients as well as our opinion of whether it is the right product to use for the growth and health of your hair. Butea Gum Tree is an herb which is also known as the flame of the forest and is grown in India. This herb has astringent properties and is very useful when it comes to scalp treatments. Climbing Butea, on the other hand, can strengthen hair right from the root and therefore, increase the tensile strength as well as the density of your hair. It should be used once daily and twice in case of severe hair loss. You need to massage the cream gently into the scalp using your fingertips. It is important that you cover the entire scalp, part by part. However, for best results it is recommended that you leave the cream in your scalp overnight and rinse in the morning. There are no possible side effects of this cream as it is made up of the extracts of natural herbs. However, it can cause staining on your clothes. The manufacturer has not listed the price of this product on their website. This can be really frustrating for the consumers as they would now have to search the internet to ascertain if the product is within their budget. This product is available on Amazon at a price of $9.49. The manufacturer of this product does not offer any kind of guarantee and this is an area of concern because if you are not satisfied with the product and if it doesn’t show the desired result then you have no way of getting your money back. The product only has a few mixed reviews which makes it a questionable purchase. Anti Hair Loss Cream by Himalaya is the first hair loss treatment in the world which is based on a bioactive enriched herbal extract. The cream is made from the extracts of Butea Gum Tree and Climbing Butea and the manufacturer claims that not only can it control the loss of hair but it can also promote growth. The manufacturer also claims that visible effects can be seen within a period of two weeks and a forty percent hair regrowth can be seen within three months. There was a clinical study performed at the Apollo Hospital in the city of Chennai in India which indicated that prolonged use of this product for up to six months can bring about a seventy percent reduction in hair loss. However, this cream does not work in the cases of male pattern baldness which is baldness due to any genetic reasons. In addition to this, the manufacturer also doesn’t offer any kind of money back guarantee. So this may not be the most ideal product for you. John Brownstone	reviewed Himalaya Anti Hair Loss Cream	on July 29th	 and gave it a rating of 2.5.